This tour visits all of Namibia's top highlights, north and south, including the Etosha National Park, Damaraland, Twyfelfontein, Swakopmund and Sossusvlei. Your safari starts at the airport where your guide will meet you. We depart from Windhoek towards the north in the direction of Okahandja. If time permits we will stop at the large open Craft Market here, which boasts crafts from all over southern Africa, including Namibia, Zimbabwe, Zambia and South Africa. You will enjoy lunch on the road before arriving at the lodge where we will overnight. Dinner at the lodge. We continue northwards into the Etosha National Park, arriving at the lodge in time for lunch. In the afternoon, we go out on our first game drive where we will experience Africa's wildlife up close. Dinner and overnight at the lodge. Today will be a full day of safari game viewing allowing plenty of opportunities for good sightings and spectacular photographs. After breakfast at the lodge, we go out on our morning game drive. We will enjoy lunch in the park/lodge and then return to our game drive in the afternoon. Today we travel through the park and into its southern regions. We will spend the whole day on safari. We enjoy lunch at one of the resort camps inside the park and will have dinner and overnight at the Okaukuejo lodge. After breakfast at the lodge we travel into the stark, but incredibly beautiful Damaraland towards the Etendeka mountain range, passing by Kamanjab. We will enjoy the opportunity of stopping over at a Himba village at Otjikandero, a village built to demonstrate how they live. This ancient tribe of semi-nomadic herders have managed to survive and keep their traditions despite the harsh desert environment in which they live. They wear few clothes apart from a loin cloth or goat skinned mini skirts. The women are reknowned for the red ochre and fat (otjize) which they rub over their bodies to protect themselves from the sun, and which gives their skin a rich red colour. They are also known for their jewellery and intricate hairstyles. We will have lunch on the road or at a restaurant before continuing through scenic landscapes and arriving at our lodge by the end of the afternoon. We have dinner and overnight here. After breakfast at the lodge we continue our journey through striking landscapes, enjoying lunch on the road or at a restaurant. In the afternoon we visit the Damara Living Museum. The Living Museum of the Damara lies close to Twyfelfontein and is the first traditional Damara project in Namibia and the only one of its kind. Here we have the unique opportunity to experience traditional Damara culture. 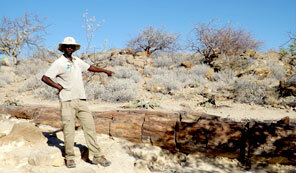 Together with the Bushmen, the Damara belong to one of the oldest nations in Namibia. Their original nation was a mixture of hunter-gatherer culture and herders of cattle, goats and sheep. Although their culture is now largely lost, the museum contributes to its preservation, as well as bringing in an income for the Damara community that built it. We arrive at our lodge towards the end of the afternoon. After breakfast we visit of the celebrated rock engravings of Twyfelfontein. Back on the road again, we meet up with some of the locals along our journey. We pass by Namibia's highest mountain (Brandberg), which reaches about 2573 metres above sea level. Lunch will be enjoyed on the road, at a restaurant or at Uis, before continuing our journey to the coast. We have dinner at one of Swakopmund's many fine restaurants. We will overnight at a hotel / guesthouse. After breakfast, we will depart for a boat cruise which includes a wonderful brunch (no lunch). Sandwich Harbour 4x4 Drive on the Namib dunes with a very well experienced off-road driver including champagne and a lovely brunch with a selection of seafood. Quad bike ride in the dunes boasting lovely views of both the sea to the west and the plains on the east. 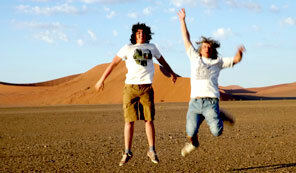 We depart for Sossusvlei, travelling south. Lunch will be enjoyed on the road or at a restaurant. The journey takes us through beautiful, scenic landscapes, including passing by the Kuiseb Canyon and across the Tropic of Capricorn. We may even spot wildlife, including mountain zebra, springbok, ostrich and even suricate. We arrive at our lodge during the late afternoon. We set out early after breakfast to visit Sossusvlei. The area is best known for its spectacular red dunes, some of which are considered the highest in the world reaching 300m. Sossusvlei itself is a large, white, salt and clay pan located in the midst of this ancient, red wilderness and provides wonderful photographic opportunities. Occasionally the pan fills up with water offering a fantastic spectacle as the glassy lake reflects the surrounding dunes. Despite the harsh desert conditions in the area, one can find a wide variety of plants and animals here which have adapted to survive. Lunch will be enjoyed at the lodge before setting off again to Sesriem Canyon. The canyon has been shaped over millions of years by the Tsauchab river and is one of the few places in the area that holds water all year round. It is up to 30 metres deep at points and about 1km long with a width of between 1 and 3 metres. The canyon is a fun and interesting place to visit and walk through it narrow passageway viewing the different rock formations and exposed layers along the way. We return to the lodge in the afternoon. After enjoying breakfast at the lodge, we depart back to Windhoek via the great escarpment mountain range and then over the Khomas Hochland. Lunch will be enjoyed on the road or in a restaurant. On our arrival, we book you into your hotel for the night, if you are still spending a night in Windhoek.